WARNING! This addin depends on Element Buster Level, because you need the Darkness Product. 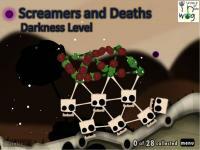 One of the levels that you can't see the Darkness Products. With your structure pitted by a group of spikes, the pipe is at the left side of the screen. Just you know that its easy to get a least move or least time records. 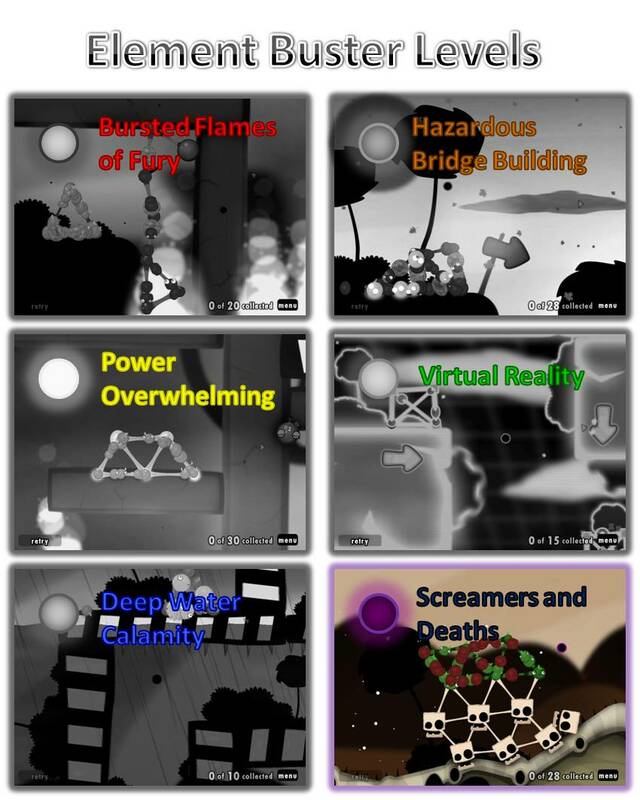 Try find the Darkness Products and Collect them to gain bonus and OCD. Darkness Element - this element can make the goo ball's color darker and rarely more tough. But sometimes it can go on destruction by destroying a block or kill a goo. For more info, go to the Element Buster Level! inwog's 11th Single Level Addin. - Cursor changed to Purple. 95 appears to be the max. I know why there are two bombs. how does the purple element ball "kill" other goos? how can a goo kill another goo? Nah. It's Just a description and the purple element balls are just products. Btw, Stop being puzzled, it's so annoying. Descriptions like those that aren't true tend to confuse! It would be cool if it did all those things, though! That would be a new thing of programming! Someday, if there's an attribute that a single goo can kill from another goo. That would be great, but it's not available in the balls.xml. Too bad. The two bombs are for accessing the fire goos in the "cage" and use the other one to explode the ceiling for the elements!!! Why this level opens me fatal eror after I start task manager? HELLO!!!!!!!!!!!!!!!!!! Why there is no answer - this level is crashing my computer!!! BUT WHY????????? The problem is in goos! Goo balls "Darknes product" doesn't exist! Inwog didn't made them up (I've looked it the level editorto find out the ploblem (I'm just messing about by not saying properly that word)!!! MOM, you should unpublish this level until he wont fix it!!! What???? 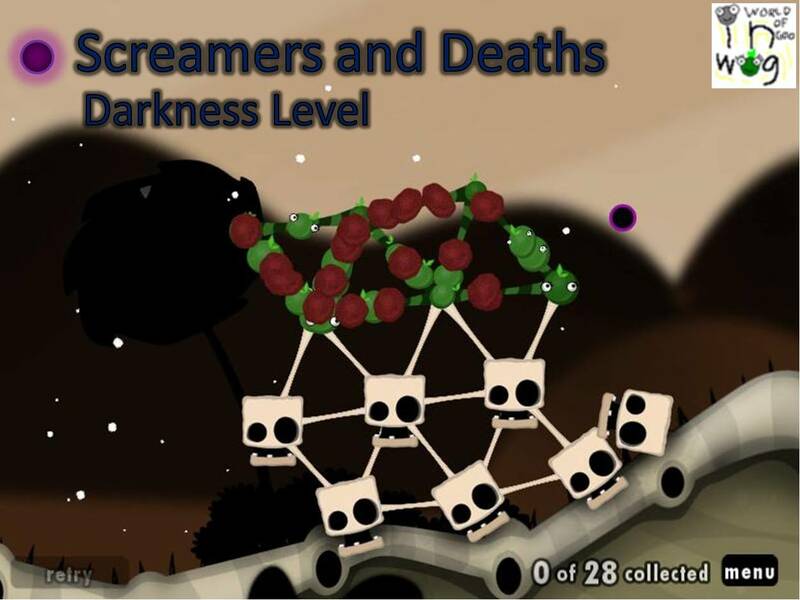 For level like this level name doesn't fits together. But otherways... good level and good name!!!! Yes, it exists. It's in the Element Buster level. That's why you need to have Element Buster to play this. Element Buster is a very simple level. It doesn't really matter if you have it and don't play it.